McCarthy Marie has been living in the Fond Cani community, a few kilometres east of the Dominica capital Roseau, for 38 years. The 68-year-old economist moved to the area in 1979 following the decimation of the island by Hurricane David. As Hurricane Maria continues to barrel its way across the Caribbean, details are slowly emerging of the number of deaths and the extent of the devastation left in its wake in Dominica. The tiny Caribbean island of Dominica has moved one step closer to its dream of constructing a geothermal plant, a project that is expected to reduce the country’s dependence on fossil fuels. With Antigua and Barbuda joining St. Kitts and Nevis as the two eastern Caribbean nations to attain middle-income country status, a senior diplomat has identified climate change as a major factor preventing other nations in the grouping from taking the same step forward. When Tropical Storm Erika hit the tiny Caribbean island of Dominica on Aug. 27, 2015, it killed more than two dozen people, left nearly 600 homeless and wreaked damages totaling more than a billion dollars. The Mountain Chicken isn’t a fowl, as its name suggests, but a frog. Kimisha Thomas, hailing from the Caribbean island nation of Dominica, remembers a time when she could find these amphibians or ‘crapaud’ as locals call them “just in the backyard”. Christmas 2013 was the most “dreary and depressing” Don Corriette can remember in a very long time. 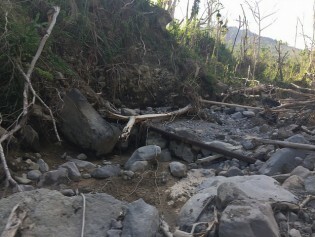 When Dean, the first storm of the 2007 Atlantic hurricane season, lashed Dominica on Aug. 16, it left behind a trail of destruction, claimed the lives of a mother and son, and decimated the island’s vital banana industry. Despite having an abundance of wind and sunshine, Caribbean countries have found that going green is requiring significant shifts in policy, and most importantly, significant financing. Caribbean countries, struggling to emerge from a slump in exports and falling tourist arrivals brought on by the worldwide economic crisis that began five years ago, have one more thing to worry about in 2014. Guyanese President Donald Ramotar says the death and destruction caused by intense rainfall in three Caribbean Community (CARICOM) countries over the Christmas holidays is a sign that the region has no time to lose in fortifying its resiliance to climate change. Ralph Gonsalves fought to hold back tears as he shared how his cousin was killed the night before Christmas. Colleen James arrived in St. Vincent and the Grenadines from Canada two days before Christmas hoping to enjoy the holiday season with her family. Now she’s getting ready to bury her two-year-old daughter and 18-year-old sister. The tiny island of Nevis in the northern region of the Lesser Antilles is one of the few remaining unspoiled places in the Caribbean. It is now seeking to become the greenest, joining a growing list of Caribbean countries pursuing clean geothermal power. Malcolm Wallace always knew on which side his bread would be buttered. It has taken just eight inches of water for Jamaica to be affected by rising sea levels, with parts of the island nation have disappeared completely, threatening people's livelihoods and much more. One daunting scientific forecast states that almost half of the world's population will live in areas of water scarcity by 2030. Yet Christopher Husbands, the head of Grenada's National Water and Sewerage Authority (NAWASA), is unfazed. What a difference a trip makes. Before visiting the French island of Guadeloupe, Alfred Rolle had vocally expressed fears about the possible health effects of a decision to drill geothermal wells in the village of Laduat on the outskirts of Dominica's capital. Eighty-year-old Rupert Lawrence has been living in the Dominica capital, Roseau, for nearly 60 years. Like visitors to the island, he too is fascinated by the fact that the town square has a river running right through its centre.